There are two Induced Draft (ID) Fans critical to the operation of each 700+ megawatt turbogenerator at this Power Station. Staff had been monitoring a steady increase in axial vibration at the Fan Drive End Bearing of one of the two ID Fans for Unit 3 turbogenerator. The axial vibration amplitude had increased from 1.75 mm/sec RMS to 8.5 mm/sec RMS over a 2-month period. 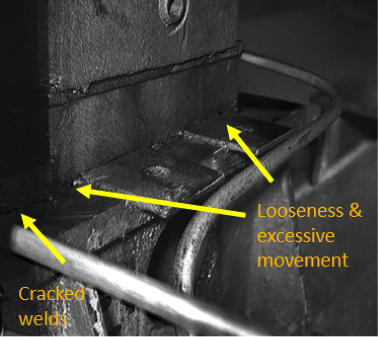 The vibration analysts were finding it difficult to identify the root cause of the increasing trend and noise coming from the coupling through traditional vibration analysis techniques. Historically this type of fault would have been left to run to failure resulting in a $70k/hour loss of generating revenue for the business. In alliance with the generator’s engineering team a leading global consulting company, ALS Industrial, applied RDI’s Motion Amplification™ software to help solve the emerging ID Fan problem. From arriving at the location of the ID Fan in the power station, setting up the video camera and acquiring several videos it took less than one hour. This hour included the time to analyze the results all of which was done in the field. The videos helped identify several problems including coupling wear and movement on the shaft, bearing housing hold down bolt looseness, frame pedestal bolt looseness and cracked welds between the bearing housing spacer block and fan drive bearing pedestal. During a low load period and a 300MW restriction the coupling, bearing housing and bearing pedestal issues identified were rectified. When the fan was returned to service the high axial motion and vibration had been reduced by more than 70% and was now 0.6 mm/sec RMS. The solution to this problem was expedited and better understood through the application of RDI’s Motion Amplification™ software.